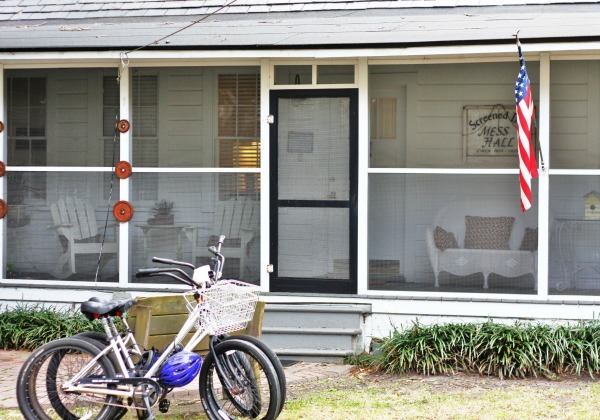 Welcome to the charming Screened Inn on beautiful Tybee Island just off the coast of Savannah Georgia. 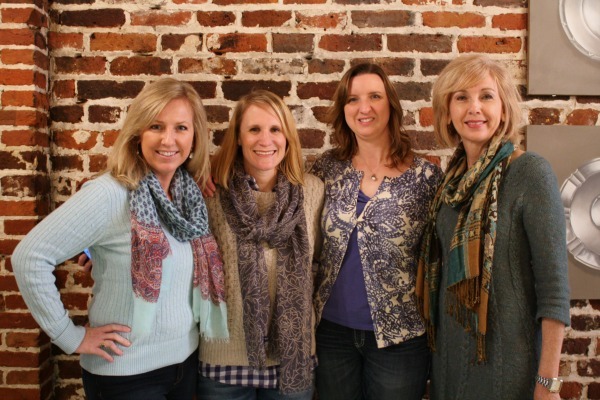 I had the privilege of attending a little blogger retreat last week, organized and hosted by Rhoda of Southern Hospitality, Diane of Mermaid Cottages, and Kathy aka the author Mary Kay Andrews. There were about 20 of us and we all stayed in several of the Mermaid Cottages. Brittany from Pretty Handy Girl, Holly from Storywood Designs and I all stayed in Screened Inn. Open the gate and let’s take a tour! 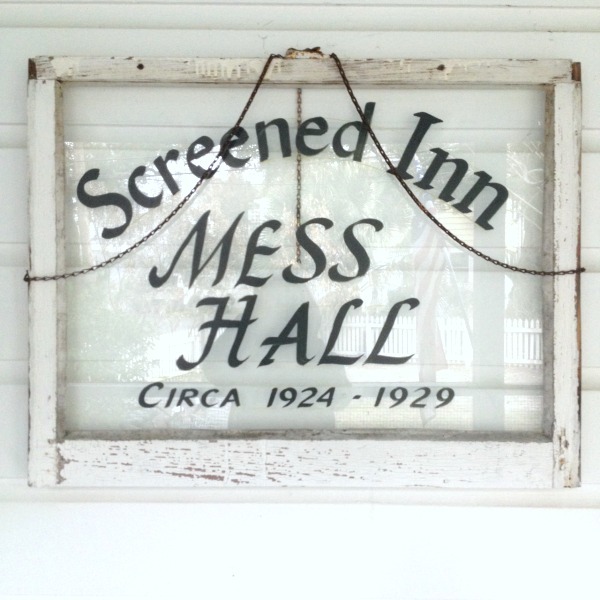 Screened Inn cottage used to be a mess hall for the officers of Fort Screven back in the 1920’s. It is now divided into a duplex hosting two cottages. 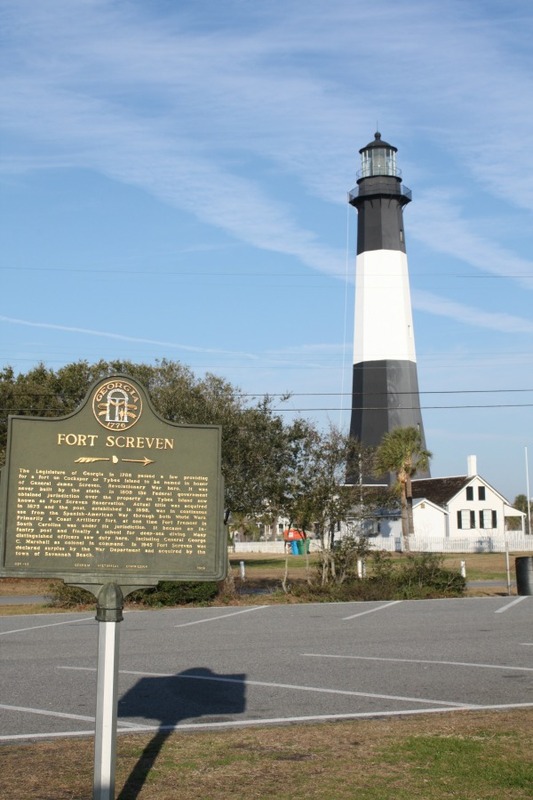 The Screened Inn cottage is also just a very short walk away from the beach and the historic Fort Screven Light House. 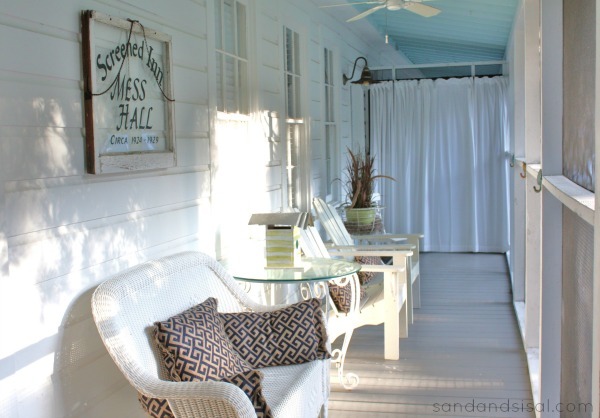 The screened porch is long and expansive, full of rocking chairs and couches where you can sip some sweet tea and enjoy the ocean breeze. Our weather was rather nippy but I can just imagine how nice this porch would be in warmer months. 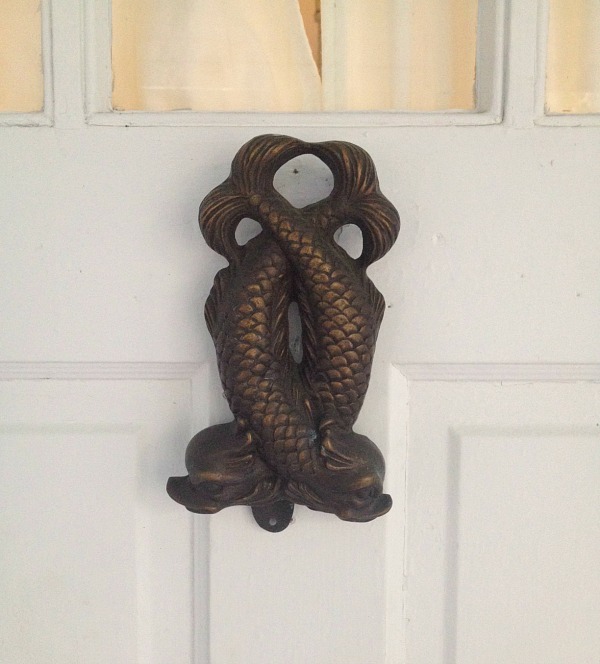 If you remember, I recently posted about Coastal Door Knockers and was pleasantly surprised to be greeted by this bronze fish door knocker! 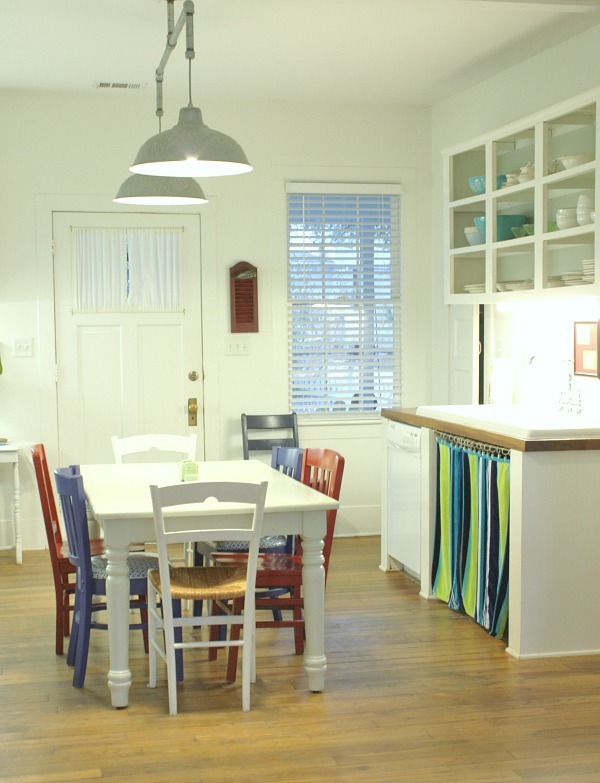 Step inside and enter the bright and cheery cottage kitchen, with open shelving, board and batten walls, and industrial lighting. The kitchen is stocked nicely and is large enough to host a crowd. The Screened Inn received a decorative makeover a few years ago by Kevin and Layla from the Lettered Cottage. 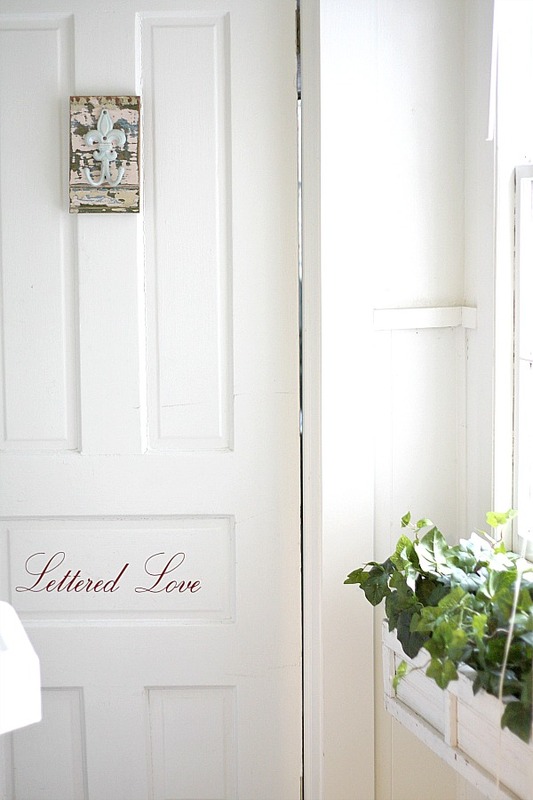 So let’s enter the master bedroom, cleverly titled the Lettered Love room! 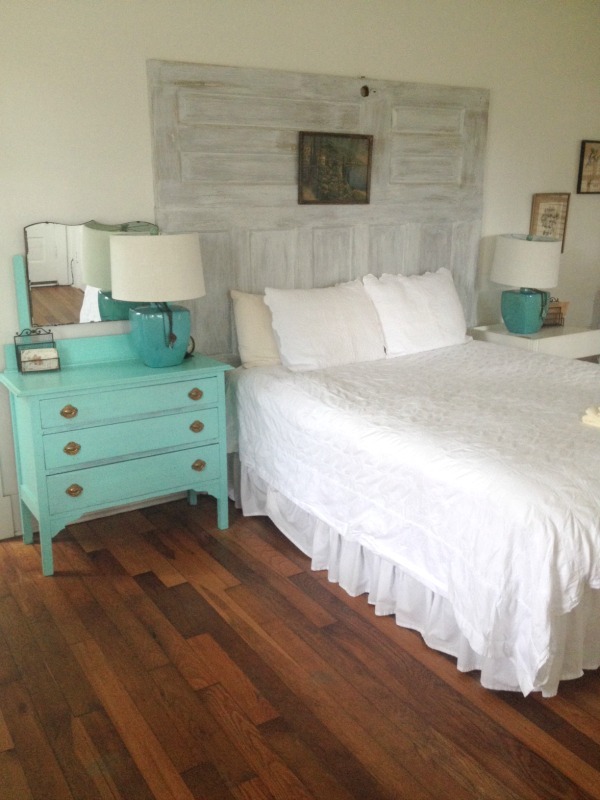 The super comfy bed boasts an impressive headboard made from upcycled old doors finished in a driftwood whitewash. 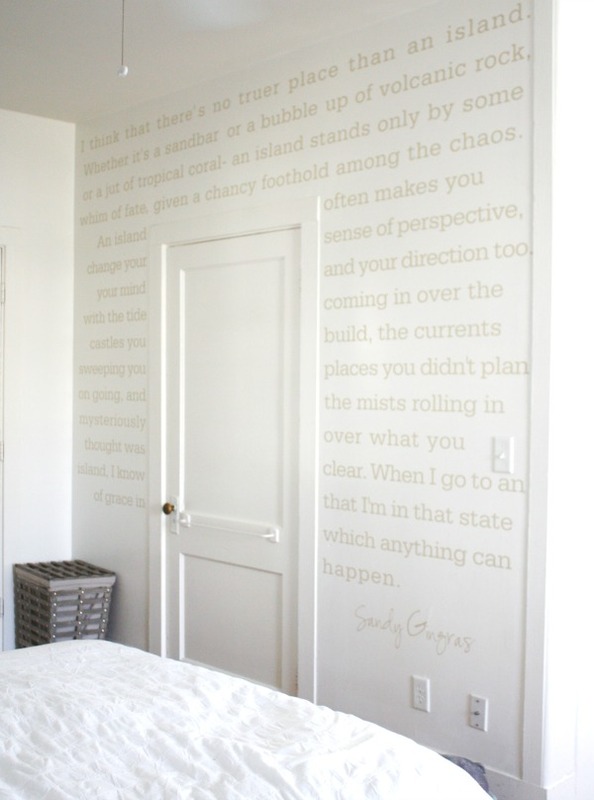 And across from the bed is the Lettered Wall which displays a lovely quote about an island. 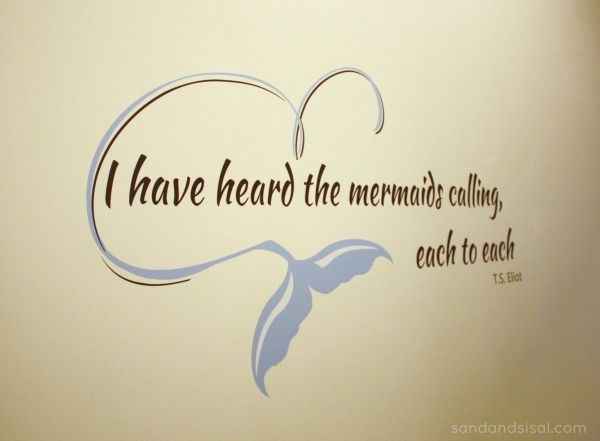 This wall quote vinyl decal was created and installed by my friend Leen the Graphics Queen. 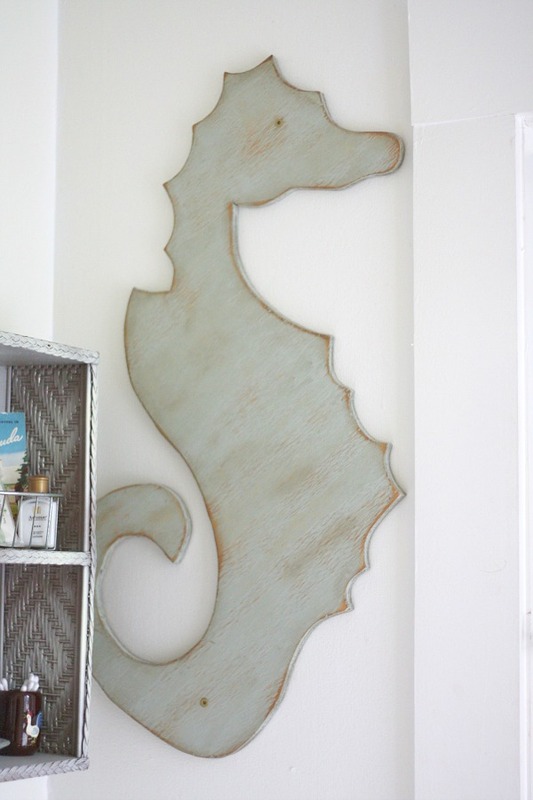 The home is filled with fun coastal decor like this wood sea horse wall hanging. I wanted to take him home with me! 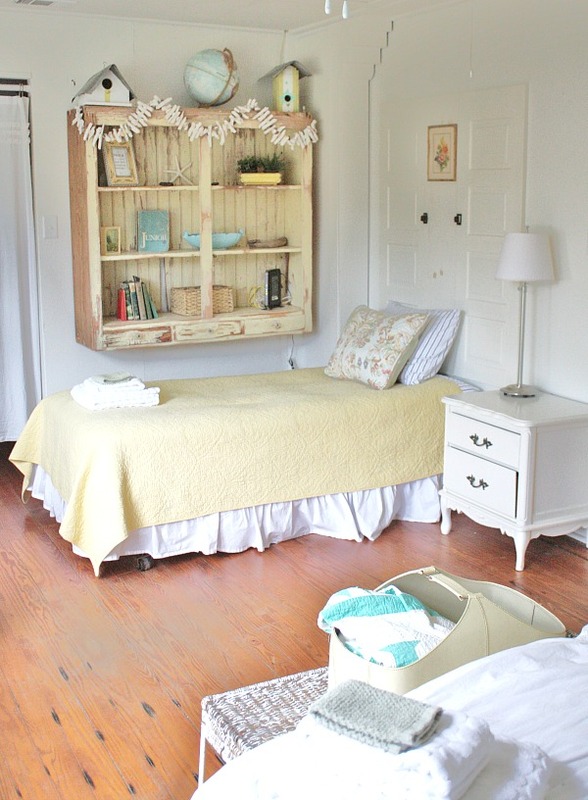 The 3rd bedroom which holds a queen and twin bed is called the Lemonade Mermaid room. Cheerful pops of sunny yellow decorated the room. 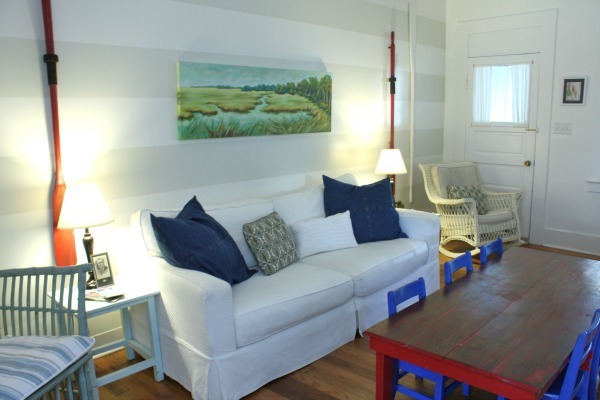 The Screened Inn family room holds plenty of seating and is decorated in a fun nautical motif. I loved the bold stripes painted in a soft and subtle gray. How fun is this idea? Starfish are strung and hung from the ceiling above a shelf which runs the entire length of the room. 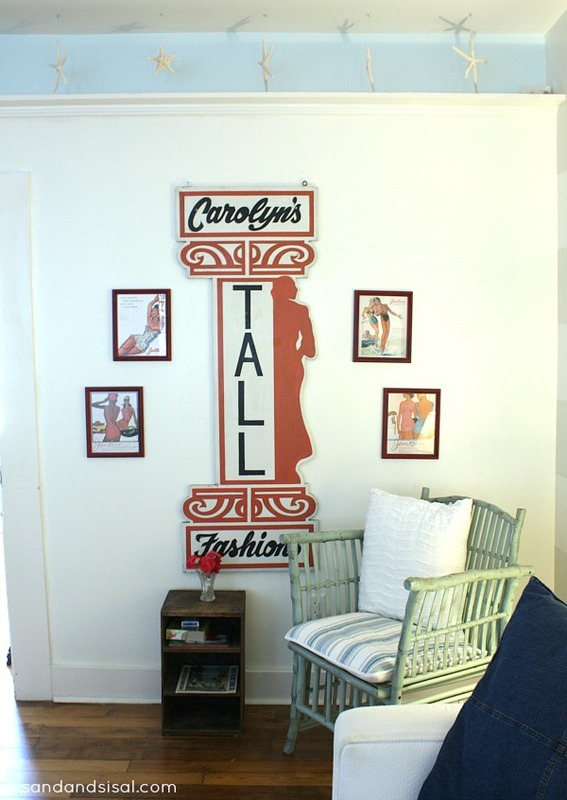 The cottage also is filled with vintage finds and artwork. 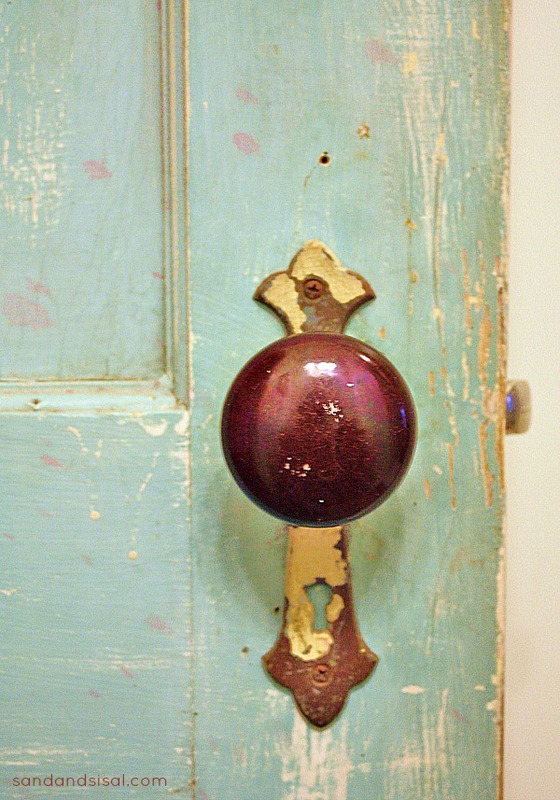 I instantly fell head over heels with this antique door knob on the chippy turquoise distressed door. How gorgeous is that?! I’ll be posting more about our girlfriend getaway on Tybee Island and Savannah later this week. 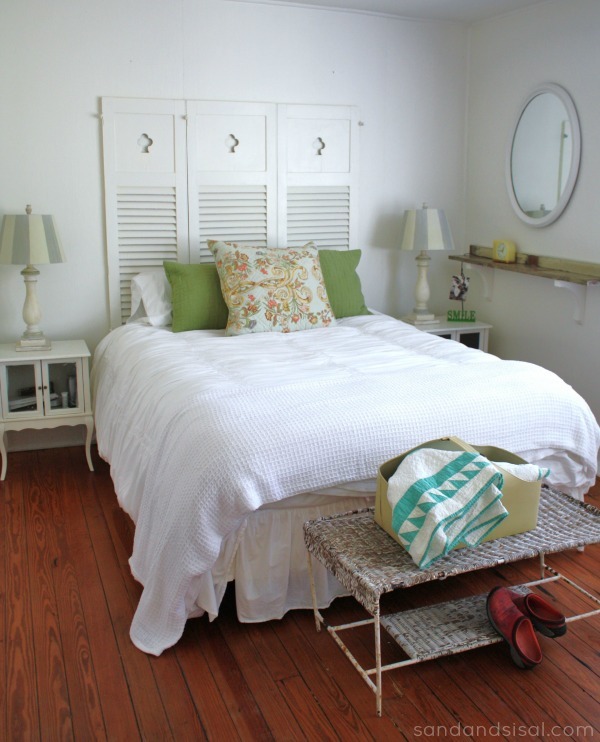 Hope you enjoyed the Screened Inn Cottage tour! Wow! Thank you so much for this wonderful bit of armchair travel today. I already feel relaxed just looking at the beautiful pictures and catching the beachy vibe of the place. Don’t you just love seeing the decorations and becoming inspired by it all? Thanks for the tour. what fun! such a beautiful place to stay! Have always wanted to visit the island… now Ai am intrigued indeed. |The cottage is so bright and cheerful. a luv the décor. It was so much fun following all of you on your fun and exciting trip!…I love that seahorse too! 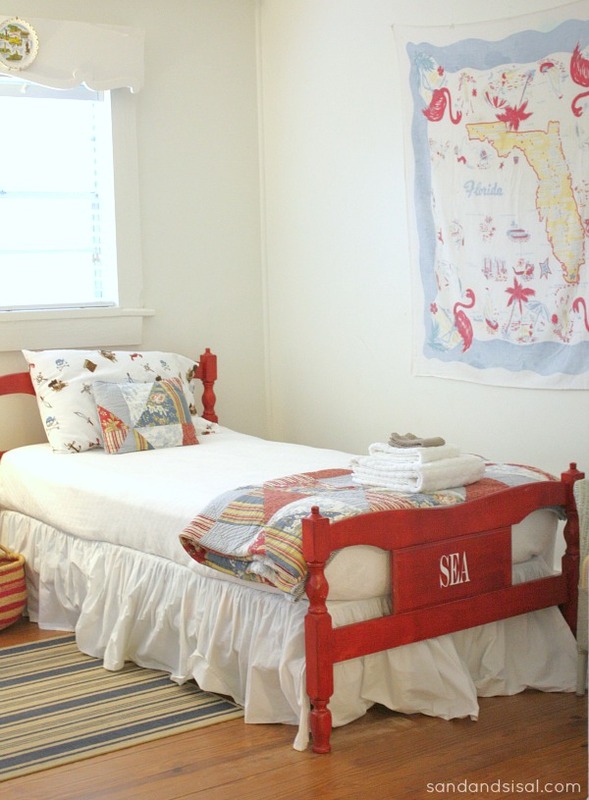 I’ve always wanted to stay in one of those Mermaid Cottages — so cute! 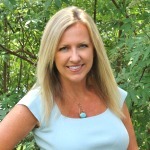 Look forward to hearing more about your meet up! 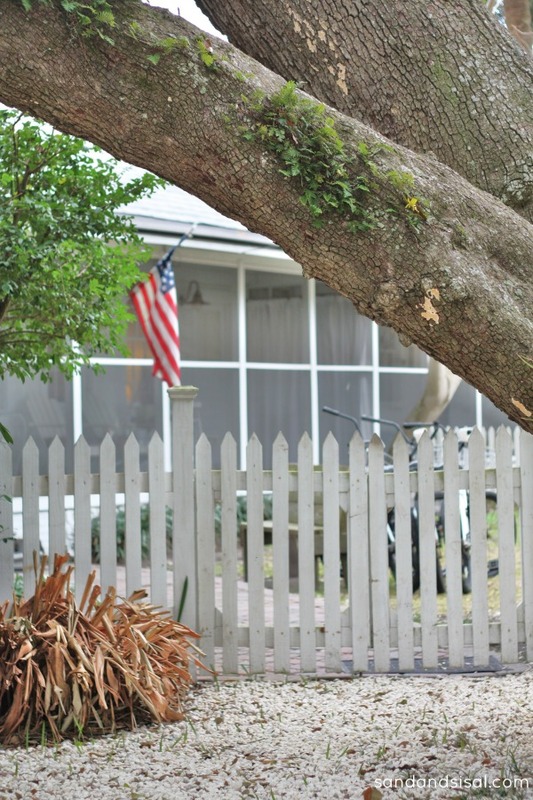 Love, love, love Tybee. My husband and I went there for our 30th Anniversary. Our first full week away without children ever. We’ve been away without them for weekends but never a full week. I can’t believe we’ve never done that before. It’s a wonderful place. Can’t wait to go back. Loved the tour! Wish we were headed back right now! Had such a fun time with you Kim, it was a dream weekend! Love to you. What a sweet place to stay. I’ve never heard of that island, now I want to go! Nice…but did they change somethings the Layla & Kevin did ? Hi Bev, yes, it does look some things were changed up a bit and rearranged. I noticed that too. You had one of the most charming houses. I loved the history behind it and the entire island. What fun it was to get to meet you and spend time together on Tybee Island! I’m so glad that you posted this tour of Screened Inn. The “Ladies” hated that we missed seeing this one. Sure do wish we could go back there! I have heard great things about Tybee but have never been there. 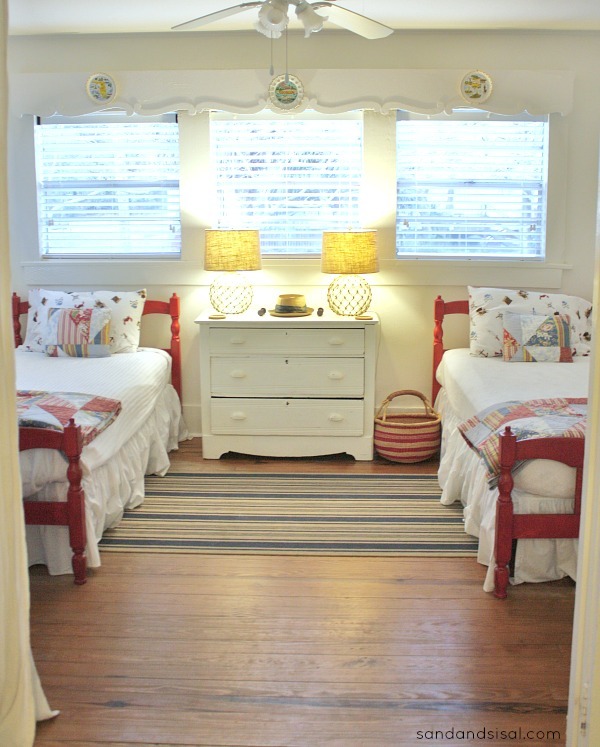 The cottage is adorable!